Disney Pictures will release a film later this year about the life of Ugandan chess sensation Phiona Mutesi, starring Oscar winner Lupita Nyong’o. Mutesi learnt chess at age nine and became Uganda’s junior chess champion when she was 11, and the nation’s national champion at 15, in a combined male and female competition. 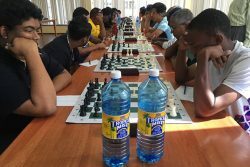 The film is based on the bestselling book, The Queen of Katwe: A Story of Life, Chess, and One Extraordinary Girl’s Dream of Becoming a Grandmaster by Tim Crothers. The New York Times referred to the book as “astonishing”. Katwe is an underprivileged area in Uganda. 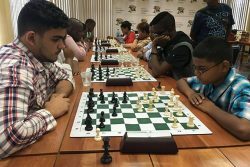 To produce a national chess champion, therefore, is sensationally unlikely, and enriches the tale in an inspirational manner. The wonder of Mutesi’s story is so intriguing that it puts the tale in the least believable order. One may be tempted to contend it’s a fairy tale coming alive. Whatever it is, the story is true. International chess player from Uganda Phiona Mutesi is photographed holding the chess queen in her palm, her favourite chess piece. A Disney film about Mutesi’s road to becoming an accomplished chess player, The Queen of Katwe starring Oscar winner Lupita Nyong’o, is set to be released in September. 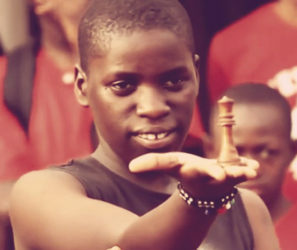 Mutesi has inspired a fair number of young women to play chess. An absolute entry to all local chess tournaments, is Frankie Farley (left). Unless he is travelling, Farley contests every competition. He remains a menacing figure in tournaments and disappoints many who have intentions of winning prizes. 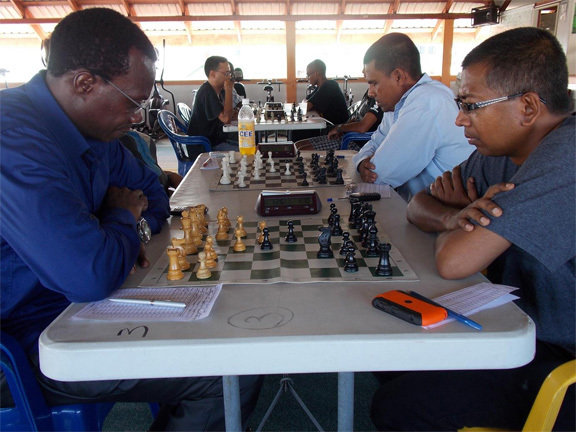 That is the nature of competition that is required in local chess. 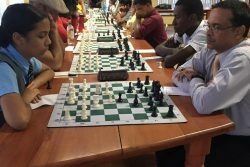 The Guyana Chess Federation is hosting a seven-round Swiss-system tournament that began yesterday and continues today at the National Resource Centre in Woolford Avenue from 09:30 hrs. In 2013, Mutesi was invited to the Women of the World Summit in New York City where she met with Garry Kasparov. She played a game with the former world champion. The purpose of the summit was to highlight women who made positive changes in various endeavours in life. Mutesi was invited to share how she overcame so many obstacles to achieve her international level as a chess player. Every year, the Summit honours a select few of the women as ‘Women of Impact’. Mutesi was one of the three for 2013. She was awarded a US$25,000 grant to be used for chess promotion and education among girls in Uganda. Mutesi had hoped to attract 50 girls to the first-ever chess clinic for girls in Uganda, but instead 400 girls turned up to the two-day clinic. Now chess is thriving in Uganda. The Disney film promises to pierce a heart of stone.